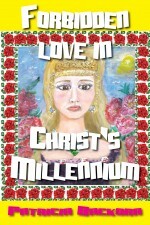 Forbidden Love in Christ’s Millennium is the story of Lydia Savage, an unconverted woman who does not fit in her own world: the future Millennial Reign of Christ on earth. While her husband Saul suffers for his sins, she loses patience with him and leaves him for someone who seduced her in Tough Love in Christ’s Millennium, Book One. For months Lydia has vacillated between her love for Saul and her infatuation with Bruce, her painting instructor. Lydia feels she has much more in common with Bruce, a cult leader who longs to take back the world from Christ and restore “All Power to the People”. Despite Saul’s tearful pleas, Lydia walks out on him for being unable to enjoy the pleasures of married life with him during his period of punishment. Bruce knows that in times past he abused Lydia’s trust and friendship. Bruce is overjoyed that she’s forgiven him and has “come home”. Together they lie in bed, feasting and fantasizing about the wonderful life ahead of them at the rebel colony in Magog. During Lydia’s short stay at Bruce’s, all sorts of outrages are perpetrated by Bruce. But that doesn’t dampen Lydia’s ardor for him. Disapproving, invisible angels keep watch. But they can do nothing yet. Will Bruce and Lydia make it to Magog, or will they push their luck too far?